This is my fifth season of growing my own food, and believe me, it never gets old. Once you taste a ripe tomato from the vine, you never go back. I grow everything from seed. Believe me, it is not intimidating at all. In fact, it is down right fun especially for your kids or grandkids. They can watch the miracle of this little seed emerge from the soil and become a plant. So, I am here to coax you to think about growing your own food. Before you start with “the but, but, Anna”, hear me out. Refrigerator Drawer just for my seedlings! cheaper than buying plants and you can use your seeds for a couple of years. I store mine in the refrigerator. They even have their own special drawer. (Yes, they are royalty.) My favorite seed companies are Baker Heirloom Seeds, Heirloom Seeds, and Seeds of Change. I happen to love heirloom seeds since the vegetables can be so different. Remember, I grew a lemon cucumber which looks like a tennis ball? These little cukes are such a show stopper. No pesticides used. If you want to grow without pesticides, then either you have to find organically grown seedlings or grow you own. I haven’t had much luck in my area sourcing organic seedlings. You might have better luck in your area. Educational. As I mentioned earlier, your kids will really dig this adventure. It is a great way to get them excited about gardening and perhaps eat from the garden. No GMO seeds (genetically modified seeds.) You know I am anti-GMO and think Monsanto is part of the evil umpire. (Princess Leia, where are you when we need you? Oh,I forgot you are busy doing the Jenny Craig commercials. Um, Carrie Fisher, for those who do not understand my humor.) Make sure wherever you buy your seeds that they are not genetically modified. Ready to start growing? Watch the below video on how to grow your own seedlings. Gardeners, chime in to add to your advice in the comments below. Still unsure? Check out my sage gardening advice article where you can learn by my mistakes. Why is it the coolest to grow your own food? More and more people are eating so unhealthy these days. In fact, obesity in our children is a growing concern. Eating more fruits and vegetables are sure to help shed those extra pounds and put you on track for eating healthier. How many of you have eaten veggies right off the vine? Raise your hands? One, three, oh I see twenty hands in the air. Oh, I didn’t see you back there. Now all of you who have your hand raised, how did the veggie taste? Amazing? So, unsupermarket like? #3 Lowers your Food Carbon Footprint. Traveling back and forth to the grocery store creates a nice food, size-me-up footprint. Plus, your grocery store food might have traveled 1000 miles before it got to your plate. How about a few steps from the garden instead? I can’t Anna. I don’t have the _____. Okay, you fill in the blank. “I don’t have the time, room, patience, money, or I hate gardening.” (I covered my ears on the last statement.) I hear you. Start small and grow container pots. Consider growing window sill herbs to get your feet wet and give you some confidence. Buy organic seedlings if growing them doesn’t float your boat. I promise. I won’t get mad at you. I just want you to grow your own food. Really, really hate gardening? Hard for me to believe, but anything is possible. Next best thing? Buy locally at farmer’s markets. Baby steps are fine. This is how I started. (Really, Anna? I can’t see you doing anything small.) Believe me. I first started with 4 tomato plants and some broccoli. (Oh, and some blueberries and cauliflower.) That’s it. If I can grow, so can you. Are you thinking about growing a garden or patio plants? Have some fears about growing a garden? If you already have a garden, what are you planting this year? If you have a garden, why do you grow your own food? Any “don’t do what I did” advice for our beginner growers? I know you have a lot to say! Have you started your seedlings? How many can’t wait until Spring? Very nice article. I have grown our own for years. You are correct in saying nothing tastes as good as food you grow yourself. I would say tomatoes and peppers but after a long winter each new crop is very welcomed. Can not wait for the cold crop to be put in and ready to eat. We not only grow for fresh eating but preserve enough for the entire year. 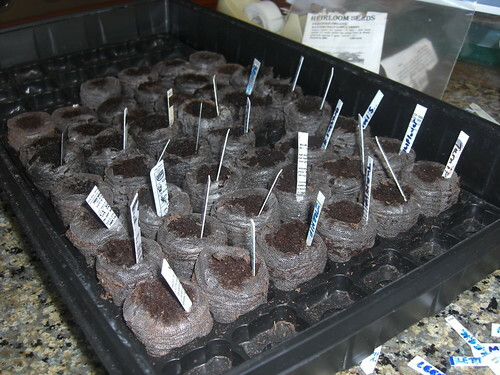 Sharold, I am growing turnips, broccoli, etc seedlings right now. I preserve too but I freeze in glass. How do you preserve with canning? If so, what tools do you like. I have a dehydrator too and was playing with it this winter. Do you have one of those too?